I was very lucky years ago when I attended my first symphony. I was taught beforehand not to applaud between movements. It’s just not done. During the performance, however, a few poor souls clapped in between movements. Rather than use that opportunity to teach them something I had only learned earlier that day, I swear a hundred heads shot backwards and fired daggers out of their eyes. The first time I went to a jazz club, I had no idea what the expected culture would be, but the people I was with encouraged me to participate and interact where appropriate. There are many different cultures in this world. Many whose manners would seem opposite to what we were taught. I’ve noticed that there are cultures that are inclusive and those, usually originating from societies with class-systems built in, that are exclusive. What then, is the culture of your school? So what’s the culture in my school? Is it an inclusive or exclusive one? Is it one that fosters collaboration? Our constituents include students, parents, teachers, staff, administrators, and the greater community. Can we define that culture and make everyone feel included? Do we teach someone how to eat rice with chopsticks or laugh at them trying? Which Came First: The Paper or the Computer? For the young children we educate now, they arrived into this world where both existed at the same time. This “TED talk” below features Conrad Wolfram trying to change the paradigm of how math is taught. If you’re familiar with him, he’s the man behind the website Wolframalpha. It’s quite a fascinating website. If you’re a math nerd, or even a teacher wanting to make math relevant to kids, it’s a great website. Just type in any equation like “2+2” without the quotation marks, or “2,5 torus knot” and see what you come up with. Then get crazy and try entering your birthday or an historical event. For those of you who remember the quadratic equation, ask yourself when was the last time you used it. More importantly, if you do remember it, ask yourself, how, why, and when you would use it? I think I’m safe with 2nd grade math, even though it’s important to stretch kids in every possible way. For middle school teachers and beyond though, he poses a very good argument. One thing I certainly agree on is that we all need to support kids with estimation, reasonableness, and mental math strategies. It’s well worth the 18 minute video, especially if you’re interested in math ed. reform in this country. Alternately, with TED talks, you can click on a link to get the transcript, if that’s your prefered method of learning. Here’s the blurb from TED about the following video titled, Teaching Kids Real Math with Computers. 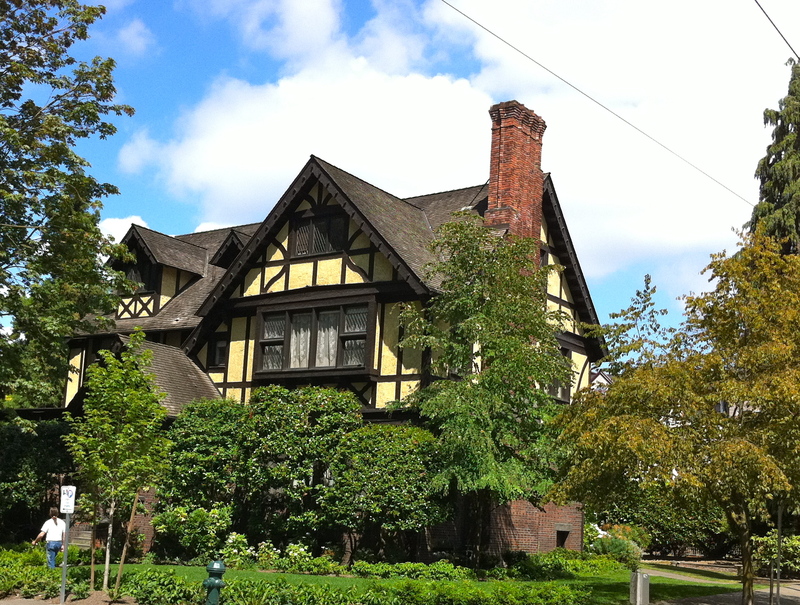 Yesterday afternoon, I took a tour of the Dearborn and Stimson Green Manors on First Hill in Seattle. There are really only four manors left in this area of Seattle which is filled with apartment buildings, condos, and hospitals. Seattle is a fairly new city. We do not have 16th century monasteries converted to apartments, so much of our old buildings, what we do have, is often worth preserving. Of course in a growing city, land becomes more valuable and the values of historical preservation and economic value often compete with the latter winning. I am grateful that we have some non profits like the Washington Trust for Historical Preservation, And others like it. Our school is about to begin a new chapter with a state of the art green building. I couldn’t be more excited. We’ve preserved an older building and connected it to the new by skybridge. Rather than razing the houses that were on the land that was purchased by the school, two were moved and relocated. Progressing forward without forgetting the past is important. Our school is 50 years old. We have some great archival artifacts. I wonder if there’ll be a space for those in our brand new and inspiring library. To read the rest of David Brooks’ column, click here. The final two chapters in the first section of the book Transforming Professional Development in to Student Results finish up what Reeves writes is wrong with today’s professional learning. I will take a break from posting this book before heading in to section two where he discusses HOW to create high impact professional learning. In these two chapters he highlights the following things to be wary about. Schools should invest not in brand name programs, but in people and practices. He criticizes many schools for talking about the importance of distributed leadership, usually at conferences where only senior leaders are invited. (Quite a departure from the norm, my school sent me and 6 other colleagues to this year’s NAIS conference). Effective learning happens if we work towards mastery of fewer but essential disciplines which include: focus, repetition, and effective practice.